A Sierra Leonean sprinter who competed in last summer’s Commonwealth Games in Glasgow is facing deportation from the UK after sleeping rough on London’s streets this winter. 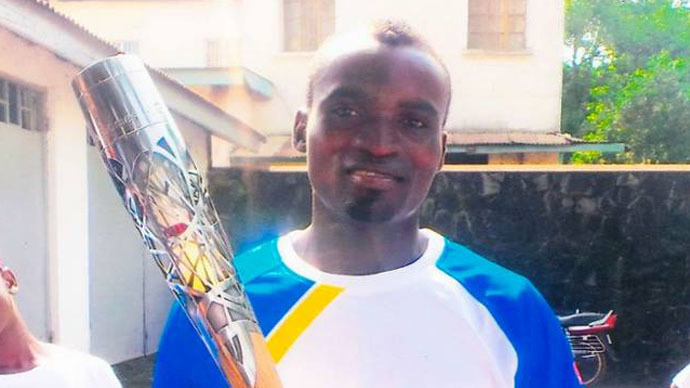 The athlete’s family perished in the Ebola outbreak. Jimmy Thoronka, 20, was arrested last Friday for overstaying his visa. He has lodged an asylum claim with the Home Office. He was released from custody a day later to find an online appeal supporting his case had been launched by people from across the globe. Within three days, the GoFundMe campaign had raised more than £23,000 ($34,000). Thoronka arrived in the UK last July to run in the 4 x 100-meter relay in the Commonwealth Games. While competing last summer, Thoronka learned that his entire family had been killed in the Ebola epidemic. Help from thousands of people poured in within days. A petition urging the Home Office to “give Jimmy the chance to start a new life and realize his huge potential as a sprinting star” has gathered nearly 60,000 signatories. Another asking for his deportation to be stopped has won 5,000 supporters so far. “I was hoping to win a medal for my country. But during the Games I got the terrible news that my uncle had died, probably from Ebola,” Thoronka told the Guardian. “I couldn’t stop crying. It was difficult to continue with competing but I tried to carry on … I wanted to go to London for a while after the Games but my bag with my money and passport in it was stolen at Glasgow station,” he said. When he arrived in London, Thoronka had nowhere to stay. He slept in parks and on night buses and begged for money to buy food. Dent, who has never met Thoronka, told the BBC: “Obviously Jimmy broke his visa which wasn't great. But I believe he did this because he had a genuine fear for his life whilst under incredible stress given the loss of his family to Ebola. However, a spokeswoman for the charity Asylum Aid said she was concerned what kind of support Thoronka will receive from the British immigration system. “The cuts to legal aid have made it a lot more difficult for refugees to get adequate information,” Zoe Gardner told Reuters.